The true traditional recipe for Périgord sauce, cooked with black truffle juice and truffle breakings, for an unforgettable flavour. Use: serve warm to accompany tournedos, roast beef, duck breast, pan-fried chicken liver, fresh foie gras, puff pastries, fresh pasta, etc. 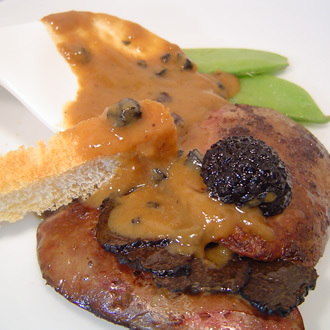 Ingredients: veal stock, truffle juice, duck foie gras 5%, truffle breakings 1%, salt, modified starch, sugar. Will keep unopened for up to 3 years.